If you’ve been thinking about trying Facebook ads to promote your business – to generate leads and/or sales – then here’s 3 simple strategies that can be used for almost all business types. And if you’ve tried Facebook ads before but didn’t get the result you were hoping for, then chances are good that you didn’t try 1 or all of these strategies, so… hang on for the ride and let’s get going. Now, firstly, BEFORE I start talking about strategy #1, I just want to quickly touch on a super-important fact that you need to be aware of when it comes to using Facebook ads. Ignore this fact at your peril! You need to keep in mind that unlike Google AdWords, where people are actively searching for an answer or solution to their problem, your potential customers are NOT on facebook trying to buy whatever it is that you sell! Let’s be honest here. Facebook is not called a SOCIAL media network for no good reason. People are on there being social! They’re chatting to friends and family, they’re keeping up to date on the gossip, and they’re interacting in groups and on pages that are focussed on their hobbies and/or interests. So, whether your potential customer is hanging out talking sports with his or her friends, or asking for advice on which restaurant to take the family to dinner, or killing time while ignoring the commercials on TV, they are not – I repeat – NOT there to buy something. Now, I’m not saying you can’t sell to cold audiences on Facebook. It can be done, and I have successfully generated well in excess of a million dollars of direct sales for clients on FB, BUT, it requires the right strategies. I’m telling you here and now that if FB ads hasn’t worked for you or someone you know, it’s because the strategy was wrong! Anyway, that’s a story for another day, so let’s get back to our 3 strategies. So, #1 is really simple. If you sell a product or service that clients have lots of questions about &/or they need help understanding the real benefits of your offering, then I often run an ad campaign that directs people to a blog post or Frequently Asked Questions (FAQ) page on the client’s website. Within that content piece, I like to provide high value, quality, unbiased information which helps potential customers make an informed wise buying decision. I’ll also often use these content pieces to bust myths and misconceptions about the product or service I’m offering. Within the content – usually towards the lower half of it, I’ll then put some calls to action to invite the reader to contact my client for a quote, or even to buy something if it’s a low priced product. This strategy is what I call the “Give To Get Investment” – I’m providing genuine value to the reader upfront, with no expectation of a sale, BUT there is an offer to take the next logical step should they find your information was useful and helpful enough that they wanted to move forward. By “giving” freely and without restriction, I put myself in a much better position to “get” the enquiry or order from the prospective customer. The added beauty of this kind of FB ad campaign is that the ads themselves don’t have to pitch a product – they just offer free information to help people understand what they might not yet understand about the product or service I’m marketing. These kinds of ads TEND to work much better than those asking someone to buy something or get a quote from a sales person. They’re much less threatening and typically you can drive quite a lot of clicks from the ad through to your website, where they can then learn what you want them to learn. So, a great example of this is from my days as the Marketing Manager of a company doing lead generation for the solar power industry. Yes, lots of my Facebook & Google ads where a straight-up offer to get quotes for a solar power system for your home or business, but I quickly discovered that there was a lot of confusion and misconceptions in the market place about solar. Now, I knew this was wrong because most people actually don’t know how to measure the savings they make with solar. So, I wrote 2 separate blog posts on the topic, answering the myths and misconceptions, and explaining clearly HOW to calculate the savings you get from solar. I then started running FB ads showing these 2 blog posts to people and the results they got where amazing! I was seeing sales leads coming in at literally HALF the price of the normal leads I got from Google and FB ads just inviting people to get a quote. Here you can see an example of the ad I used. Note: It even says it’s a blog post, and it just offers to answer peoples questions about solar – to help them make an informed decision. And here you can see the blog posts I wrote and promoted on FB. Notice this one is mostly content and then as you scroll down the page, you start to see these very simple subtle links inviting you to get 3 quotes for solar. This kind of campaign is possibly one of the simplest to run, as long as you have good quality FAQ/educational style content to answer peoples’ questions. Note I said FAQ/educational style content, NOT a blatant sales pitch from start to finish. If you do the latter, this won’t work. By the way, if you don’t have FAQ/educational style content on your site, get cracking and create it. Compile a list of the most common questions people have about your product or service, as well as a list of the biggest myths and areas of confusion they have before buying, and then write the answers to these questions and myths out. After that, the ad itself is fairly simple. OK, so onto Strategy #2. This one might be better suited to some kinds of business but not others. You’ll have to be the judge of that when it comes to your business. So, the short version is that you run ads making an offer to prospective customers to get a discount, a special deal (like a 2 for 1, or buy 2 and get 1 free, etc.) or even a free sample or trial of your product. This kind of ad works really well for low priced products such as food, subscription services, software, and even lawn mowing services, as one example. If you have a pizza bar or a restaurant or a café, offering a free item can work really well, whether you’re trying to get people to try you for the first time – get them in the door with a free pizza, cake or even coffee, and then – MOST IMPORTANTLY – wow them with your service and food quality so they want to come back! Most of the time I see food businesses trying this strategy, they screw it up with the last part of the formula. If you don’t impress them, they won’t come back, so make sure you focus on delivering an exceptional experience. As for those businesses that just want to generate repeat business, offer them a loyalty card deal. For example, buy 4 coffees and get the 5th one free, or order 4 pizzas and the fifth is free, etc. You can also just run free giveaway bonus offers on Facebook to repeat customers only to bring them back. As for services businesses, if you can, offer a free trial of your product or a significantly reduced price for the first month. I mentioned software as an example, so if you were doing the marketing for Microsoft for example, you might try offering 1 month’s free trial of Microsoft Office 365 – their monthly subscription product, and then they go onto the normal monthly rate afterwards. In most cases, the hardest part for a business is to get a NEW client in the door to try them out, so if your business fits one of these kinds of examples, consider that special offer as a way of boosting the effectiveness of your lead generation, instead of going for a cold sale to someone who doesn’t even know you and how great your service and product quality is. Now, strategy #3 is a little more complicated and not typically as fast a way to sale as the first 2. It’s basically for you to advertise to capture a lead or enquiry, whether via phone call, email or even on your FB page, and then keep communicating with them. 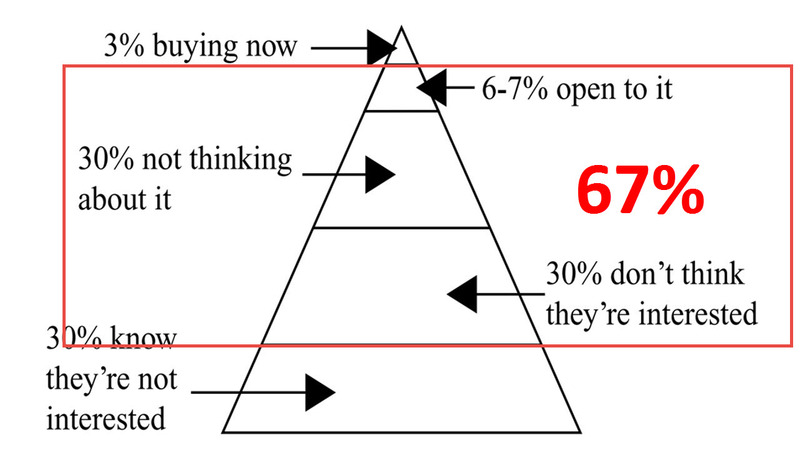 That diagram shows that on average, only about 3% of people are buying right NOW, out of the entire market for your offering, so if you just try to focus on that 3%, you’ll miss out on getting more sales from the other 67% that didn’t buy right now, but might in the future, IF you give them a good reason to buy from you. After 12 years in the digital marketing space, if I had to pick 1 thing most businesses do badly that costs them heaps of sales and revenue, it would be this – staying in communication with your prospective clients. Continuing to educate, entertain, help, advise, even give them a laugh or two at something fun or silly that happened in your life – all these things can and DO turn nos into yes’s – just further down the track. So, capture that lead’s contact details, whether it’s a phone number, email address or even easier, cookie their web browser so you can follow them around the web with retargeting ads… and STAY IN TOUCH with them! OK, that’s it for now. If you haven’t ever tried one or more of these strategies, give it a go. Done right, I am confident they WILL bring in leads and sales for you. And of course, if you’d prefer someone just come in and set it all up for you – create the FAQ style content, put together the special offers and/or set up a system to stay in touch with your leads – then reach out to me and I’ll schedule a time to discuss your options. Regardless of whether I do this for you or you do it yourself, just do it!